Anyone with a kid or kids in minor hockey knows how hectic life can be. So why not get some meal ideas from 25 pros such as Kyle Turris, Jay McClemment and Cassie Campbell! From The Publisher: Hockey families across Canada face a familiar dilemma: How do you cook for kids who are on the ice six nights a week and eat dinner at different times each evening? Breakaway: The Ultimate Cookbook for Hockey Families provides the answer: simple, easy, nutritious meals that kids will eat. 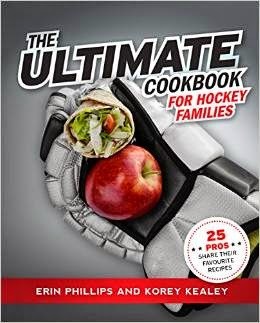 This book is filled with tips and tricks to relieve the stress on busy hockey parents, whether they’re juggling meals at home or trying to come up with something nutritious on the road. In this book, hockey stars like Ottawa Senators centre Kyle Turris, Toronto Maple Leafs assistant captain Jay McClement, and Olympic gold medalist Cassie Campbell offer their recipes and their secrets for how they prepare for the big game and how they feed their muscles afterwards. With hockey embedded in the design and in every recipe, tip, and trick, this book aims to delight and inform aspiring hockey players, figure skaters, and the whole family support team.